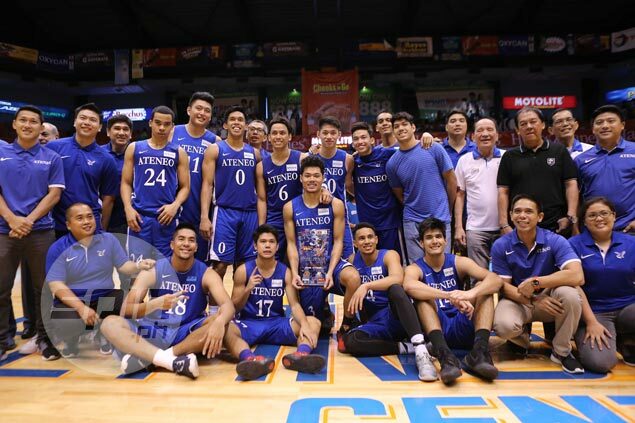 ATENEO defeated National University, 66-54, on Sunday to salvage third place in the Filoil Flying V Preseason Premier Cup. Chibueze Ikeh had 18 points and 17 rebounds, Vince Tolentino added 15 points and Thirdy Ravena scored 14 as Ateneo recovered from a 20-8 deficit with a 28-6 second quarter to go into halftime with a 36-26 lead. “One of our mottos is we want to play every game and fight every game. There is no exception whether you have a reason or you are tired. The players picked it up and credit to them,” he added. The Bulldogs didn’t have a player scoring in double figures, with Chino Mosqueda coming up with nine points. Ateneo 66 — Ikeh 18, Tolentino 15, Ravena 14, Ma. Nieto 4, Babilonia 4, Black 3, Wong 3, Asistio 3, Mendoza 2, Porter 0, Allmond 0, Banzon 0. NU 54 — Mosqueda 9, Aroga 8, Diputado 6, Salem 6, Gallego 6, Morido 5, Labing-isa 4, Aquino 3, Salim 3, Abatayo 2, Go 2, Yu 0, Cauilan 0. Quarterscores: 8-20; 36-26; 52-38; 66-54.